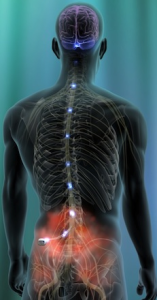 Who can benefit from a spinal cord stimulator? A spinal cord stimulator, also known as a neurostimulator, is meant for those dealing with chronic intractable pain that has been unresponsive to other treatments. This may be an individual dealing with failed back or neck surgery in which further surgery is not recommended. 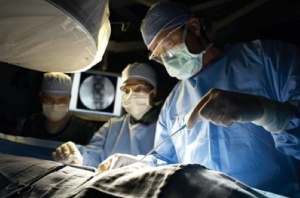 It also may be an individual dealing with post laminectomy syndrome or post thoracotomy syndrome along with other types of chronic back or neck pain. Maybe even RSD or diabetic neuropathy. Willy a neurostimulator cure my pain? A neurostimulator is not going to cure your pain. It can help it dramatically, but the purpose of a stimulator is to mask an individual’s pain when there is no treatment that will cure the problem. While spinal cord stimulators are extremely effective for pain management, their underlying purpose is only to mask pain and not cure it. How long have spinal cord stimulators been around? The first neurostimulators were created in 1967, so 45 years ago. The FDA has approved of these devices and they have gone through many improvements over the decades. The improvements have come in the form of better leads, better programming, better generators, better batteries and a smaller profile. How effective are spinal cord stimulators? Overall the effectiveness is excellent. Studies have shown that for chronic back or leg pain the overall effectiveness is 62%. However, if the problem can be treated earlier for chronic pain, within a couple years for instance, the effectiveness rises to over 75%. For an individual who is dealing with chronic pain that has not been helped by significant other treatments, 75% is a very, very good number. There was also a recent study presented regarding cervical spinal cord stimulators which also showed a high amount of effectiveness for chronic neck conditions. Is a Spinal Cord Stimulator similar to a TENS Unit? A stimulator is very different than a TENS unit. A Tens unit it is an external device that emits slight electrical impulses through foam pads on the skin. It is placed directly over the area of pain and can work to mitigate pain and decrease the amount of pain medication necessary. A spinal cord stimulator also works by electrical impulses, but these units are placed subcutaneously under the skin with leads that go right around the spinal cord for maximum effectiveness. Most tens units are not covered by insurance anymore, but are cost-effective and less then $150 or so. Spinal cord stimulators, however, are covered by insurance and typically cost in the range of $15,000. Are there risks associated with spinal cord stimulators? There is a low risk profile associated with stimulators. There is a slight risk of infection along with the risk that the lead placed will shift and need to be fixed. There are other risks of anesthesia and one of the biggest risks is that the pain will not be masked sufficiently. Overall, the benefit of neurostimulators far outweighs the risks, especially in those who are at the “end of the line” with treatment options. If you or a loved one is suffering from significant chronic pain that has not responded to Las Vegas Pain Management options, and surgery is no longer an option, let the Nevada Pain Network help you. The Network connects those in pain with Pain Management Las Vegas and Henderson trust. Call (702) 323-0553 for more information and scheduling today with pain clinics in Las Vegas! When patients are trying to avoid surgery from a pinched nerve, all methods of conservative treatment should be tried first. Especially if the surgery is not absolutely necessary and there is no increasing neurologic deficit (such as worsening muscle weakness). 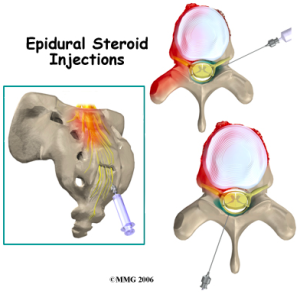 Epidural steroid injections are indicated in those patients who have sciatica, also known as lumbosacral radiculopathy. The beneficial effect of the cortisone is a function of its anti-inflammatory qualities. Since the pain is secondary to sparking up inflammation from the nerve pinching, cortisone “knocks this out” nicely. Just having a disc herniation pinch on a nerve root in and of itself doesn’t cause pain. It’s the inflammation that sparks up that leads to substantial pain. Epidural steroids have been shown to be most effective in those patients who have acute sciatica. 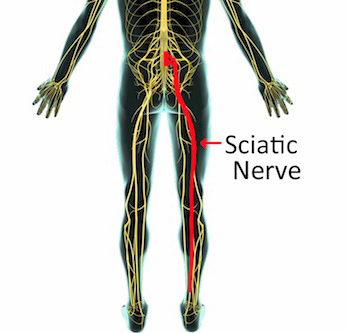 For those who have chronic sciatica, the injections are not as effective. 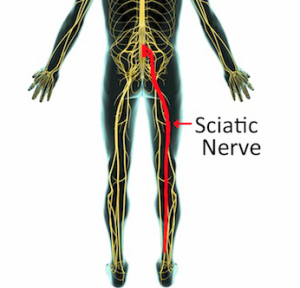 They can be very effective in those who have chronic sciatica and now a different nerve root is affected, or if they have been pain-free for a while and the pain came back. Fluoroscopy, which is a real-time form of x-ray, should be used for all epidural injections that are done of the transforaminal variety. When transforaminal epidurals have been compared with the interlaminar variety of epidural injections, they have been shown to work better with regards to patients needing less overall injections for pain relief. If an individual has been having pain less than 12 months, epidural injections tend to work better than if the pain has been going on for over a year. Additionally, it is unclear how many injections are advisable for the best pain relief and it is also unknown which amount and type of corticosteroid is best for epidural injections. Currently, a series of three injections is typically performed a couple weeks apart to obtain the best Pain Relief. If you or a loved one is suffering from back and/or leg pain in the greater Las Vegas area, help is available. The Nevada Pain Network offers pain management Las Vegas and Henderson trust. Call (702) 323-0553 for more information and scheduling with the best pain clinics in Las Vegas! Herpes Zoster is also known as shingles, and is caused when the Varicella Zoster virus is reactivated. Once chickenpox is over, the virus does not actually leave the body, but stays latent in the body. 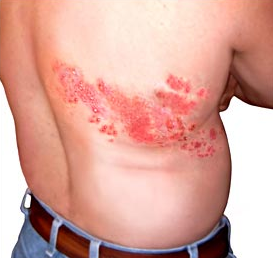 When shingles begins, initially it starts with significant pain which precedes a unilateral rash. The rash usually heals within a few weeks, but unfortunately at times the pain just doesn’t go away and turns into post herpetic neuralgia. Shingles is most common in older individuals who have a decreased immune system either from organ transplants, cancer, HIV and those types of issues. It can occur in individuals though, who have an immune system that is fine. For zoster itself, medications such as acyclovir, valcyclovir and others in that family can decrease the duration of the disease and reduce the pain. Narcotic medications and corticosteroids can also provide additional pain relief. Epidural steroid injections at Pain Clinics in Las Vegas have been shown to help as well for herpes zoster. Postherpetic neuralgia refers to pain that continues for six months after shingles rash resolves. It can be extremely disabling and can wax and wane for years. Risk factors for developing postherpetic neuralgia include older age, more intense rash or pain, and also pain over the skin that appears quite a while before the rash develops. Medication management for postherpetic neuralgia is best managed with Neurontin, Lidocaine patches, capsaicin patches, Tramadol, trycyclic antidepressants and opioids. Research has also shown that spinal cord stimulation for postherpetic neuralgia has been effective in over 80% of individuals with unresponsive long-lasting pain. If you live in the Las Vegas area and are suffering from chronic pain due to either post herpetic neuralgia, RSD or other conditions, the Nevada Pain Network can help you. The Network offers pain management Las Vegas trusts, and the pain doctors offer comprehensive pain management. Call (702) 323-0553 for more information and scheduling.